If you were involved in a car accident, one of the first steps you need to take—after being certain that you and any other injured victims receive immediate medical care—is to call the police and make a police report. This is important to do even if the damages to your vehicle are minor, and you do not believe you were injured. Why? Unfortunately, even if you feel fine, you could have suffered a long-term injury like spinal cord damage, internal bleeding, or a traumatic brain injury with symptoms that take days or weeks to develop. Even a minor accident could cause shockingly serious injuries that can limit your ability to work and your day-to-day activities. If you later find yourself in this situation, you will need a copy of the police report to help you get the compensation you are entitled to from the negligent driver’s insurance company. The date, time, and place of the accident. This can help you prove when the accident occurred. 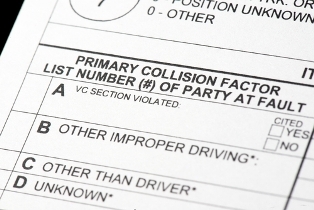 Contact information and statements from other drivers, their passengers, and witnesses. You will want to confirm that the officer obtained the contact information for any witnesses and passengers in the other vehicles or obtain the information yourself in case your attorney needs to contact them as potential witnesses in your lawsuit against the driver. A description of any injuries the drivers or passengers suffered. You can use this information to help prove your injuries were caused by the crash. A narrative of the details of the accident and what he believed caused it. He would note any contributing factors of the other driver—like speeding, having faulty brakes, or talking on his cell phone—that contributed to the crash. A diagram of the scene and the point of impact for any vehicles that were hit. The damages to the vehicles and any property. Pictures of the accident scene, damage to vehicles, and injuries. Any tickets that the police officer issued to either driver. When a police officer is not dispatched, you should obtain as much of the information that would be in the report as possible. You may be able to go to the nearest police station to report the accident. You should always follow up by obtaining a copy of the police report. The insurance adjuster will ask for a copy of the report before negotiating a settlement. The police officer is an unbiased witness who has no personal stake in your case. His observations as to what happened, the injuries he saw, and his conclusions as to what caused the accident could be more persuasive than other witness statements. The police report could lead your attorney to other witnesses that could provide helpful information for negotiating with the insurance company adjuster. If no one contacted the police after your accident, do not let this stop you from obtaining the compensation you could be entitled to. Call us directly at 706-863-6600 or toll free at 888-795-6261 to schedule a free, no-obligation consultation to learn about your legal options.